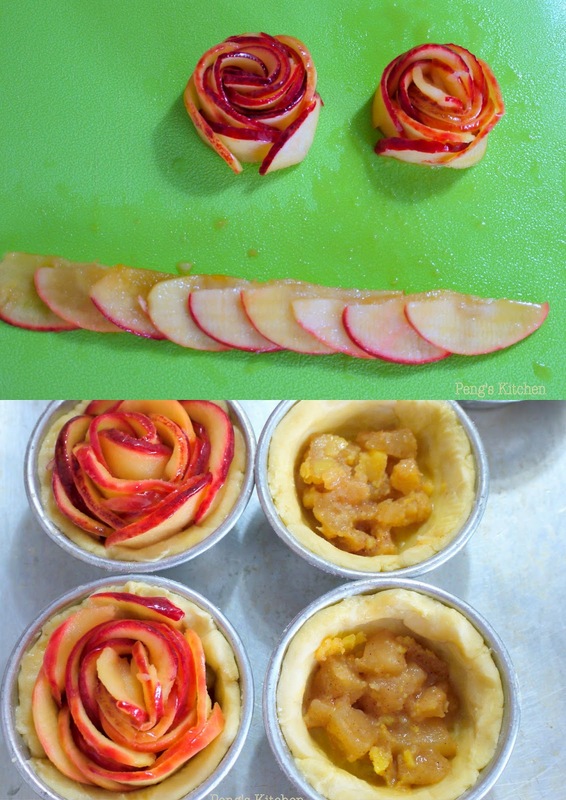 I am so mesmerised by these mini apple rose tarts, they were so pretty!! Thought it would not be easy to roll up the sliced apple ;) but it was otherwise. As long as the apple slices are thin enough and softened, it is very easy to bend and roll them up nicely ;) Not wanting the mini tarts to taste too dry after baking, I've actually placed some homemade cinnamon apple filling onto the tart base before placing in the rose apple. Double dosed of apple filling in this mini tart! Combine flour, sugar and salt in a mixing bowl. Add in cubed butter, using a pastry cutter, work in the butter into the flour until mixture looks like a coarse meal. Divide dough into 35gm each. Roll into a ball. On a floured surface, lightly roll out into a round disc. Place it into a greased muffin tin, pushing the dough up to the sides evenly. Cut apples and discard the cord. Using a mandolin, cut the apple thinly into half moons. Toss the apples with the lemon juice. Dissolve the butter and combine with the brown sugar. Pour the mixture over the apples and mix evenly. Microwave apples for about 2 mins until soft and pliable to roll. To form the roses, place about 8-10 slices of apples on a flat surface, laying them horizontally with the skin side facing you. Place each slice so it overlaps the previous slice by half. Tightly roll the apples from one end to the other. Carefully pick up the apple rose and add additional apple slices around the outside, depending on the size of the rose you preferred. Spoon tsp of cinnamon apple filling onto dough base and place the apple rose over. Bake in preheated oven at 180 deg cel for 30mins until crust is golden. Warm the strawberry preserve and brush over each rose apple to glaze. These tarts are so pretty! wow! This is deft artwork and a feast for the eyes. so pretty! I made Apple Rose Tarts too. But I learnt from your post another way of doing it. Thank you.